In 1987, Pfeiffer himself filed a FOIA lawsuit seeking the release of Vol 5; the CIA successfully convinced the court that it could not be declassified. To commemorate the 50th anniversary of the invasion, which began with a preliminary airstrike on April 15, 1961, the Archive re-posted a collection of the major reports and documents that address the Bay of Pigs, among them the Inspector General’s report, and Vol. III of the Pfeiffer report which was originally discovered and posted by Villanova professor David Barrett in 2005. The Archive also posted the only existing interview with the two managers of the Bay of Pigs invasion, Jacob Esterline and Col. Jack Hawkins, that Peter Kornbluh conducted in 1996. 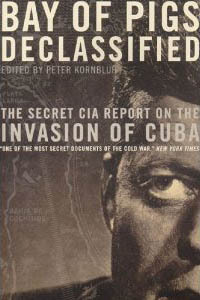 The interview was published in Kornbluh’s book, Bay of Pigs Declassified: The Secret CIA Report on the Invasion of Cuba. In March of 2001, the National Security Archive organized a 40th anniversary conference in Havana, Cuba on the Bahia de Cochinos. The conference brought together retired CIA officers, Kennedy White House officials, and members of the exile brigade with Fidel Castro and his military commanders to discuss this history. Other documents and revelations generated by the conference can be accessed here. Lawsuit - On April 14, 2011, the National Security Archive filed a lawsuit against the CIA under the Freedom of Information Act (FOIA) to secure the declassification of several volumes of an Official history of the Bay of Pigs Operation compiled between 1974 and 1983. Nearly a decade after the failed invasion, on August 8, 1973, CIA Director William Colby tasked the Agency's History Staff to "develop accurate accounts of certain of CIA's past activities in terms suitable for inclusion in Government-wide historical and declassification programs, while protecting intelligence sources and methods." Historian Jack Pfeiffer assumed responsibility for this history, which was written over the course of 9 years and is divided into 5 volumes; it is based on dozens of interviews with key operatives and officials and hundreds of CIA documents. Volume III of the Pfeiffer report was declassified by the CIA in 1998, and the rest of the report is now the last major internal study that remains secret, fifty years after the Bay of Pigs. Jack Pfeiffer, the chief historian at the CIA, researched and wrote a comprehensive history of the Bay of Pigs operation between 1974 and 1983. The CIA declassified only Volume III of the five-volume history in 1998, under the Kennedy Assassination Records Act. This three-hundred page report was discovered in the National Archives by Villanova professor of political science David Barrett in 2005, and first posted on his university’s website. Volume III focuses on the last two years of the Eisenhower administration and the transition to the Kennedy presidency. It is newsworthy for clarifying the role of Vice-President Richard Nixon, who, the report reveals, intervened in the planning of the invasion on behalf of a wealthy donor. This candid assessment was not shared with the President-elect then, nor later after the inauguration. As Pfeiffer points out, “what was being denied in confidence in mid-November 1960 became the fact of the Zapata Plan and the Bay of Pigs Operation in March 1961”—run only by the CIA, and with a force of 1,200 men. This internal analysis of the CIA’s Bay of Pigs operation, written by CIA Inspector General Lyman Kirkpatrick after a six month investigation, is highly critical of the top CIA officials who conceived and ran the operation, and places blame for the embarrassing failure squarely on the CIA itself. The report cites bad planning, inadequate intelligence, poor staffing, and misleading of White House officials including the President, as key reasons for the failure of the operation. “Plausible denial was a pathetic illusion,” the report concluded. 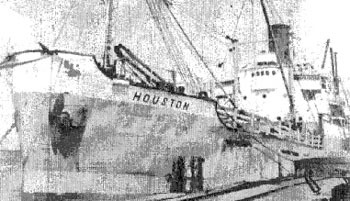 “The Agency failed to recognize that when the project advanced beyond the stage of plausible denial it was going beyond the area of Agency responsibility as well as Agency capability.” The declassified report also contains a rebuttal to Kirkpatrick from the office of deputy director Richard Bissell, challenging those conclusions. Volume V of the Pfeiffer report, titled “Internal Investigation Report,” which remains classified, also critiques Kirkpatrick’s conclusions. This May 5, 1961 report was written by Colonel Jack Hawkins, the paramilitary chief of the Bay of Pigs operation. His 48-page report cites poor CIA organization, and "political considerations" imposed by the Kennedy administration, such as the decision to cancel D-day airstrikes which "doomed the operation," as key elements of its failure. "Paramilitary operations cannot be effectively conducted on a ration-card basis," the report concludes. "The Government and the people of the United States are not yet psychologically conditioned to participate in the cold war with resort to the harsh, rigorous, and often dangerous and painful measures which must be taken in order to win." Hawkins also recommended that further covert operations to depose Castro, unless accompanied by a military invasion, "should not be made." Castro, according to the report, could "not be overthrown by means short of overt application" of U.S. force. This memorandum outlines the original plans for what became the Bay of Pigs. It was presented to and authorized by President Eisenhower on March 17, 1960. Components of the plan include the creation of a unified Cuban opposition, development of broadcasting facilities, and the training of paramilitary forces. The purpose of the operations, according to the proposal, is to “bring about the replacement of the Castro regime with one more devoted to the true interests of the Cuban people and more acceptable to the U.S. in such a manner as to avoid any appearance of U.S. intervention.” The original proposed budget is $4.4 million; by the time of the invasion the budget has risen to $45 million. In this telephone conversation between President Kennedy and his brother Attorney General Robert Kennedy, they discuss concerns that a Senate investigating committee might reveal that the President had authorized jets from the US aircraft carrier Essex to provide one hour of air coverage, to create a no-fly zone for Bay of Pigs B-26 bombers the morning of April 19. Due to a timing mistake, the jets never met up with the bombers; 2 bombers were shot down, leading to the deaths of 4 Americans. Document 8 - White House, "Memorandum for the President: Conversation with Commandante Ernesto Guevara of Cuba," August 22, 1961. In this memorandum of conversation, aide Richard Goodwin recounts for President Kennedy his conversation with Ernesto "Che" Guevara, who seeks to establish a "modus vivendi" with the U.S. government. This document is noteworth for the Bay of Pigs because Guevara "wanted to thank us very much for the invasion- that it had been a great political victory for them- enabled them to consolidate- and transformed them from an aggrieved little country to an equal." Interview - In October 1996, the National Security Archive's Cuba Documentation project arranged for the two chief managers of the Bay of Pigs operation, Jacob Esterline and Colonel Jack Hawkins, to meet in a Washington DC hotel for a lengthy filmed interview on the invasion. The meeting marked the first time they had seen each other since the weekend of April 17-19, 1961, and the first time they had together recalled the events surrounding the failed invasion. This interview was conducted by the Archive's Peter Kornbluh and is excerpted in his book, Bay of Pigs Declassified (New York: The New Press, 1998).